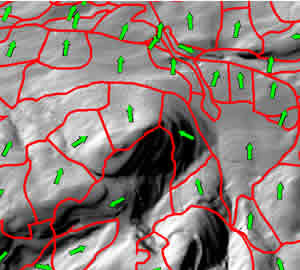 Red lines indicate forest stand boundaries on an analytically hill-shaded digital elevation model. The green arrows indicate calculated mean aspect per stand. The LMS Analyst extension was created to update polygon-level landform attributes for forest stands. The analyst computes mean elevation, slope, and aspect on a stand-by-stand basis. There are currently two versions of the LMS Analyst, one for ArcView 3.x with Spatial Analyst and one for ArcGIS 8.3 with Spatial Analyst.